Drosophila or pomace flies are small insects commonly found in association with over-ripened or rotten fruits and vegetables. There are approximately 1,500 known species in the genus Drosophila (Markow and O'Grady 2006). 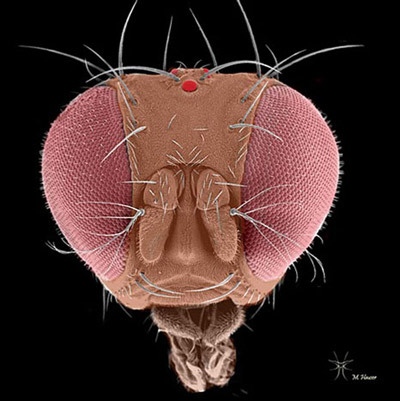 Drosophila flies are sometimes called small fruit flies. However, true fruit flies belong to the family Tephritidae. Not only are they larger, but they are common and often important agricultural pests (Green 2002). Figure 1. Adult male spotted-wing drosophila, Drosophilia suzukii (Matsumura). Photograph by Martin Hauser, California Department of Food and Agriculture. 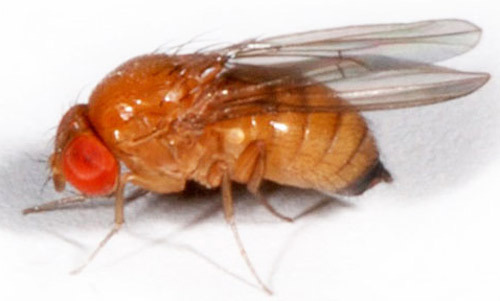 The vast majority of Drosophila flies are associated with rotten or over-ripened fruits and are nuisance pests. 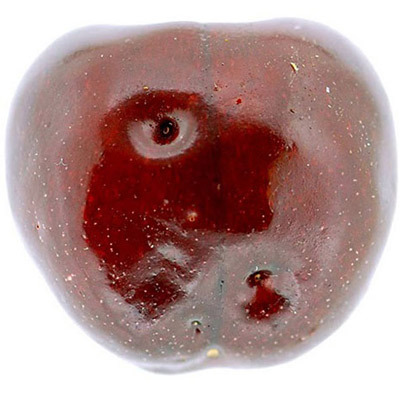 However, a few species such as the spotted-wing drosophila, Drosophila suzukii (Matsumura), can infest un-ripened fruits and are of economic significance. First detected within the continental United States in August 2008, Drosophila suzukii has become a serious threat to fruit crops. Drosophila suzukii is native to southeast Asia and is widely distributed in China, India, Korea, Myanmar, Russia and Thailand (Toda 1987, Oku 2003, Hauser et al. 2009). Within Europe, this species is also widely distributed in France, Italy and Spain (European and Mediterranean Plant Protection Organization 2010). Within the United States, it has been established in Hawaii since 1980 (Kaneshiro 1983). In the continental U.S., it was first detected in Santa Cruz County, California, on caneberry and strawberry plants (Bolda et al. 2010). Since then, it has rapidly spread to new areas including Florida, Louisiana, Michigan, North Carolina, Oregon, South Carolina, Utah, Washington and Wisconsin in the U.S., and British Columbia in Canada (Walsh et al. 2011). Adults: Florida is home to at least 27 addiional Drosophila spp. including Drosophila melanogaster. Some of these could easily be confused with Drosophila suzukii due to their spotted wings. Therefore, expert examination by a specialist is needed for positive identification and confirmation (Steck et al. 2009). 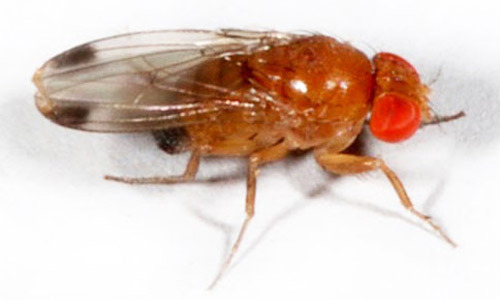 Drosophila suzukii adults are small (3–4 mm) yellowish-brown flies with red eyes. The adults have a pale brown or yellowish-brown thorax with black bands on the abdomen. The antennae are short and stubby with branched arista. Males have a distinguishing dark spot along the front edge of each wing. Spotless males are also possible, but are rarely observed in the field and should be verified by a taxonomist for positive identification. In addition, males have two rows of combs on each fore tarsus which are absent in females. Figure 2. Adult female spotted-wing drosophila, Drosophilia suzukii (Matsumura). Photograph by Martin Hauser, California Department of Food and Agriculture. Figure 3. 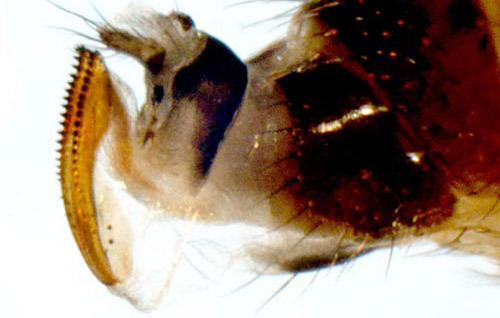 Head of an adult spotted-wing drosophila, Drosophilia suzukii (Matsumura), frontal view. Photograph by Martin Hauser, California Department of Food and Agriculture. Figure 4. Wing of an adult male spotted-wing drosophila, Drosophilia suzukii (Matsumura). Spotless males are also possible, but are rarely observed in the field. Photograph by Martin Hauser, California Department of Food and Agriculture. The females have a serrated ovipositor with which they penetrate the fruit skin. The serrations are much darker than the rest of ovipositor (Kanzawa 1939, Walsh et al. 2011). Figure 5. Ovipositor of an adult female spotted-wing drosophila, Drosophilia suzukii (Matsumura), lateral view. Photograph by Martin Hauser, California Department of Food and Agriculture. Figure 6. SEM of an ovipositor of an adult female spotted-wing drosophila, Drosophilia suzukii (Matsumura), lateral view. Photograph by Martin Hauser, California Department of Food and Agriculture. Figure 7. 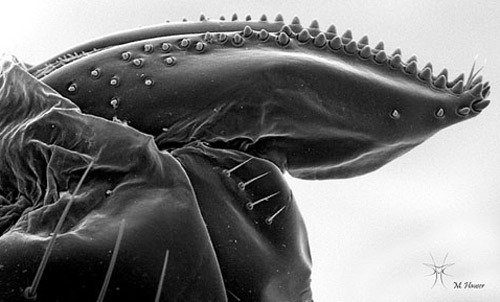 SEM of an ovipositor of an adult female spotted-wing drosophila, Drosophilia suzukii (Matsumura), posterior view. Photograph by Martin Hauser, California Department of Food and Agriculture. Figure 8. 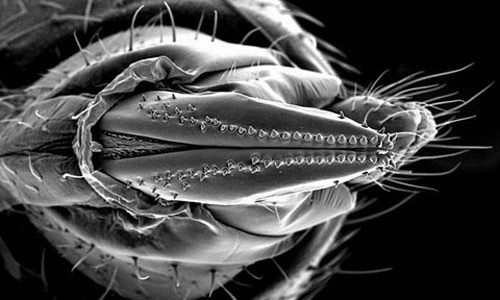 SEM of genitalia of an adult male spotted-wing drosophila, Drosophilia suzukii (Matsumura). Photograph by Martin Hauser, California Department of Food and Agriculture. Eggs: The eggs are translucent, milky-white, and glossy. The eggs develop and hatch within the fruit in which they are laid (Walsh et al. 2011). Larvae: The larvae are milky-white and cylindrical with black mouthparts. The body is tapered anteriorly with elevated posterior spiracles. First instar larvae are approximately 0.07 mm in length. Internal organs of larvae are visible after it has consumed some fruit. Larval development occurs inside the fruit and develops through three instars before pupation. 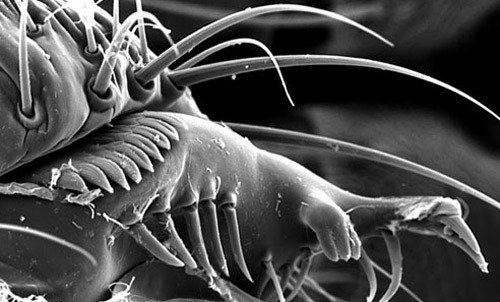 Mature larvae may grow up to 6 mm in length (Kanzawa 1939, Walsh et al. 2011). Figure 9. Larvae of Drosophila spp. on overripe banana. Photograph by Whitney Cranshaw, Colorado State University, Bugwood.org. Pupae: The pupae are cylindrical, reddish brown with two small projections at the end. They are approximately 2–3 mm long. Pupation can occur either inside or on the exterior of fruit. Figure 10. Pupae of Drosophila spp. on overripe banana. Photograph by Whitney Cranshaw, Colorado State University, Bugwood.org. Drosophila suzukii prefers a moderate climate but can also survive in cold conditions (Kanzawa 1939). The flies are most active at 20°C (68°F). Activity becomes reduced at temperatures above 30°C (86°F) or below freezing. However, Drosophila suzukii is firmly established on the island of Hokkaido in Japan where winters average -4 to -12°C (Kimura 2004), suggesting the possibility of its establishment in cooler climates. Preliminary research from Oregon suggests that Drosophila suzukii larvae, pupae, and adults have the potential to survive fluctuating overwintering conditions for periods up to 60 days. Adults are able to withstand longer periods of cold conditions than larvae or pupae (Walsh et al. 2011). In general, Drosphila spp. are very sensitive to desiccation. However, sensitivity to desiccation depends upon climatic conditions and flies could develop desiccation resistance over time (Davidson 1990, Bradley et al. 1999). Like most Drosophila spp., reproduction in Drosophila suzukii is rapid. The total life cycle may be completed within one to two weeks depending upon the climatic conditions (Kanzawa 1939). Adult life span is about three to nine weeks. However, flies emerging late in the season overwinter and may live longer. In Japan, the fly produces 10 to 13 generations (Kanzawa 1939). Flies could survive up to 10 generations per year under California climate conditions (Walsh et al. 2011). The egg, larval and pupal stages last from 1–3, 3–13, and 4–5 days, respectively (Kanzawa 1939). Degree-day models on Drosophila suzukii suggest that the entire life cycle (egg to egg laying female) can be completed within 12 to 15 days at 18.3°C (65°F) or a little more than a week at 21.1°C (70°F) (Walsh et al. 2011). A single female can lay one to 60 eggs per day and 200–600 eggs in her lifetime. A female lays approximately one to three eggs per oviposition site. The eggs are laid singly and are randomly distributed on fruits. Multiple clutches of larvae may be present on the same fruit because females may oviposit on the same fruit (Kanzawa 1939, Mitsui et al. 2006, Walsh et al. 2011). 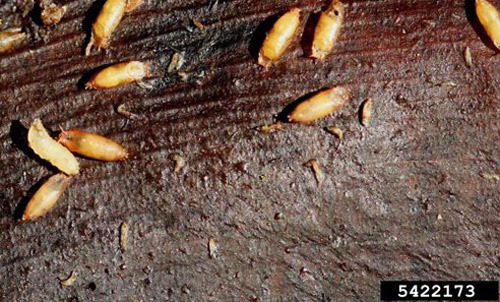 Fruit infestation is initially manifested by scars on the fruit surface left by ovipositing females (stinging). The initial oviposition site becomes sunken. Damage is caused primarily by larvae feeding on fruit pulp turning the fruit flesh brown and soft. The larger larvae cut breathing holes in fruit. Infested fruit collapse around the feeding site very rapidly and rot due to mold or secondary infections (Beers et al. 2010). Figure 11. Oviposition scars from a female spotted-wing drosophila, Drosophilia suzukii (Matsumura), on a cherry fruit. Photograph by Martin Hauser, California Department of Food and Agriculture. Monitoring and trapping. Management practices for spotted-wing drosophila are similar to those used to manage common Drosophila flies. Monitor adult fly populations before fruit begin ripening and before flies begin laying eggs. Bucket-style traps or quart containers used for monitoring other Drosophila flies can be effectively used for monitoring Drosophila suzukii. Mixtures of yeast, sugar, and water; fruit purees, distillates from apple cider vinegar or wine; ethanol, acetic acid, and phenylethanol in 1: 22: 5 ratios are potent baits for monitoring Drosophila suzukii populations. However, traps baited with yeast-sugar-water mixtures facilitate easy identification of flies because of the clear color of the bait material. Addition of a small drop of dish soap as a surfactant or placement of a sticky card within the traps improves trap efficiency by retaining the flies which have already entered the traps. The traps perform best when deployed under cool and shady areas in the field (Walsh et al. 2011). Figure 12. 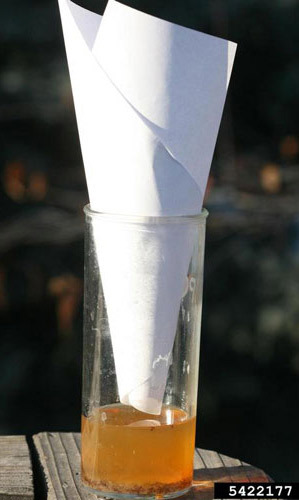 Simple funnel trap baited with vinegar to trap adult Drosophila. Photograph by Whitney Cranshaw, Colorado State University, Bugwood.org. Cultural control. Good field sanitation is critical to prevent further spread of flies. Ripe fruit should be picked frequently to minimize population buildup. All damaged fruit should be removed from the field and destroyed, either by burial or disposal in closed containers. Drosophila flies are weak fliers but spread easily through infested fruits or by wind. Therefore, all nearby sources of fruit should be managed to eliminate flies (Ministry of Agriculture and Lands, British Columbia 2009). Biological control. Parasitoids from the families Braconidae and Cynipidae are potential biocontrol agents of Drosophila suzukii. 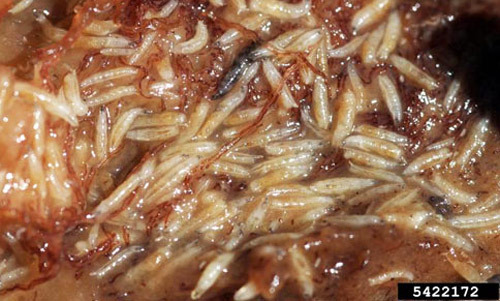 Orius insidiosus has been reported to feed exclusively on Drosophila suzukii. (Kanzawa 1939, Dubuffett et al. 2009, Walsh et al. 2011). However, the role of beneficial organisms in management of Drosophila suzukii has not been fully ascertained (Walsh et al. 2011). Chemical control. Insecticide sprays effective against other Drosophila flies are also effective against Drosophila suzukii adults. However, Drosophila suzukii's preference for ripening fruit necessitates use of chemicals with shorter pre-harvest intervals (Walsh et al. 2011). Bradley TJ, Williams AE, Rose MR. 1999. Physiological responses to selection for desiccation resistance in Drosophila melanogaster. Integrative and Comparative Biology 39: 337-345. Davidson JK. 1990. Nonparallel geographic patterns for tolerance to cold and desiccation in Drosophila melanogaster and Drosophila simulans. Australian Journal of Zoology 38: 155-161. De Camargo R, Phaff HJ. 1957. Yeasts occurring in Drosophila flies and in fermenting tomato fruits in Northern California. Journal of Food Science 22: 367-372. Dubuffet A, Colinet D, Anselme C, Dupas S, Carton Y, Poirié M. 2009. Variation of Leptopilina boulardi success in Drosophila hosts: what is inside the black box? Advances in Parasitology 70: 147-88. Green MM. 2002. It really is not a fruit fly. Genetics 162: 1-3. Kaneshiro KY. 1983. Drosophila (Sophophora) suzukii (Matsumura). Proceedings of Hawaiian Entomological Society 24: 179. Kanzawa T. 1939. Studies on Drosophila suzukii Mats. Kofu. Review of Applied Entomology 29: 622. Kimura MT. 1988. Adaptations to temperate climates and evolution of over-wintering strategies in the Drosophila melanogaster species group. Evolution 42: 1288-1297. Markow TA, O'Grady PM. 2006. Drosophila: A Guide to Species Identification and Use. Academic Press, London. 272 pp. Mitsui H, Achterberg VK, Nordlander G, Kimura MT. 2007. Geographical distributions and host associations of larval parasitoids of frugivorous Drosophilidae in Japan. Journal of Natural History 41: 1731-1738. Molina JJ, Harisson MD, Brewer JW. 1974 Transmission of Erwinia carotovora var. atropeptica by Drosophila melanogaster Meig. American Potato Journal 51: 245-250. Oku T. 2003. SWD: Drosophila suzukii (Matsumura) in Japan. Agricultural Pest Encyclopedia. Zenkoku Noson Kyoiku Kyokai 381 pp. Toda MJ. 1987. Vertical microdistribution of Drosophilidae (Diptera) within various forests in Hokkaido. III. The Tomakomai Experiment Forest, Hokkaido University. Research Bulletin of College Experiment Forests. 44: 611-632. Walsh DB, Bolda MP, Goodhue RE, Dreves AJ, Lee J, Bruck DJ, Walton VM, O'Neal SD, Frank GZ. 2011. Drosophila suzukii (Diptera: Drosophilidae): Invasive pest of ripening soft fruit expanding its geographic range and damage potential. Integrated Pest Management 106: 289-295. Publication Date: May 2011. Reviewed: February 2017.